Hi! My husband and I just moved into a new house and we have a bit of a forest problem on our hands. We have a very large tree that has spawned baby trees. 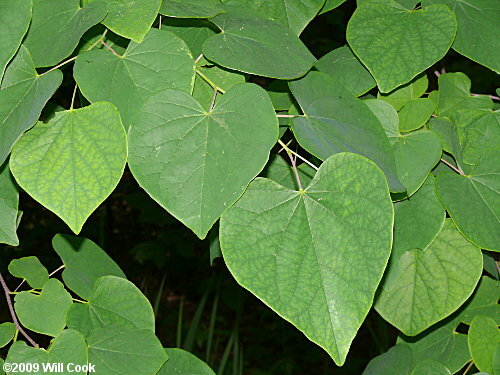 I'm sorry I don't have a picture or the name of the tree, but it has arrowhead-shaped leaves and the large tree seems to have green and red seed pods. How do we get rid of these trees? I don't want to poison the soil because we want to plant fruit trees in November and other edibles in the spring. We really don't want any chemicals. We're reluctant to hire professionals because that would probably cost a fortune. If we soaked the soil and pulled them out ourselves, would that work? Any help would be greatly appreciated! It's really hard for me to give you an accurate ID on your tree without a photo. 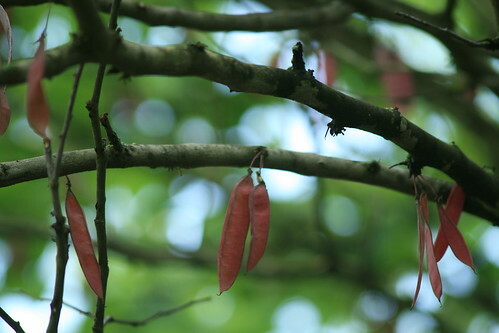 Many species of trees drop seeds and build small forests around themselves. My lovely cherry tree does it. Is there any possibility that you might post a photo for us? Depending on what size baby trees you are talking about, they should not be hard to dig out, especially with soaking the soil. redbud in my yard does spawn babies to the extent that they become weeds. The tree is none of those. Perhaps they're not arrowhead-shaped leaves but spear-shaped leaves. However, thank you for posting pictures! That was helpful. The leaves are dark green. The tree is rather large, probably a couple stories or three stories tall. There are clusters of seed pods and the pods don't look like beans but little open pods, maybe like a Venus fly trap plant rather than a pea. I've tried looking up trees with this description, but for the life of me can't find any and no pictures will upload. I apologize!